There are two ways to identify available meeting times for event attendees: using the suggested times feature and using the find a time feature. NOTE: You can only edit an event if you created the event yourself, or if the event organizer gave guests permission to modify the event. 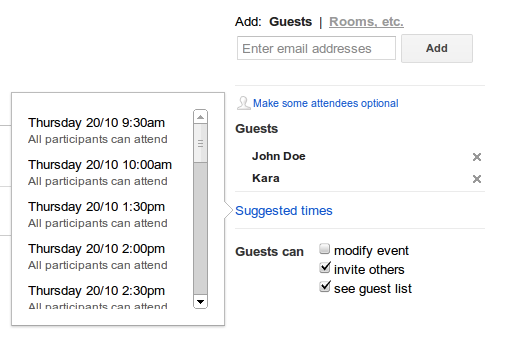 In Google Calendar, create a new event, or open an existing event (you may need to click Edit event first). Add guests (if you haven’t already done so) and then click Suggested times. The resulting list will include upcoming times where all participants are available. For example, if you want to create an one-hour long meeting with Kara, and she already has an one-hour long meeting at 3pm, then times like 2pm and 4pm will be suggested. To save the changes to your event, click Save. If the other guests have shared their calendar with you, you can use the Find a time feature to schedule an event at a time that works for everyone. You can compare up to 20 schedules at one time. NOTE: The Find a time feature is only available while using a computer, not the Google Calendar mobile device app. Add guests (if you haven’t already done so) and then click the tab Find a time. If the other guests’ calendars are shared with you, you’ll see their schedules. Use the arrows at the top to navigate between days. Once you have found a time, click the area within the calendar grid. The time will update at the top of the page. All-day events are shown at the top of the calendar grid. If a guest has an all-day event, they will appear available in the “Find a time” tab unless their event is set to show as “Busy.” To schedule an all-day event, click the Week button and then click the area at the top of a day column.